"This is the real thing! A simple mixture of masa harina and water results in the most wonderful corn tortillas you ever tasted. The secret is to use a cast iron pan! You can buy masa harina at Mexican grocery stores or in the ethnic food aisle of large supermarkets." Divide dough into 15 equal-size balls. Using a tortilla press, a rolling pin, or your hands, press each ball of dough flat between two sheets of plastic wrap. 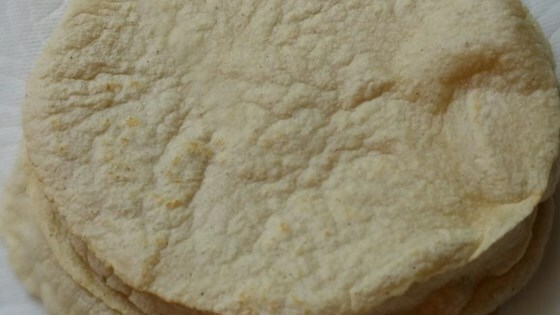 Immediately place tortilla in preheated pan and allow to cook for approximately 30 seconds, or until browned and slightly puffy. Turn tortilla over to brown on second side for approximately 30 seconds more, then transfer to a plate. Repeat process with each ball of dough. Keep tortillas covered with a towel to stay warm and moist until ready to serve. See how to make authentic corn tortillas from scratch. These were great! I used parchment paper to roll the dough. It works wonderfully. No sticking at all. I added a bit of salt to the flour before mixing it with water.